To restrain the Canons Ecclesiastical not confirmed by Parliament. Lords take the Oath of Allegiance. Against scandalous and unworthy Ministers. Message from the H. C. concerning the Bill for the better Execution of Justice in the North Parts of England. To assure the Demesnes of Damerham. To explain Part of an Act for Establishment of the Estates of the E. of Derby. p. Epus. Cicestren. p. Ds. Ellesmere, Cancellar. Angliæ. Comes Salisburiæ, Mag. Thesaurar. Angliæ. Comes Suffolk, Camer. Hospitii Regis. p. Ds. Darcye de Menell. AGREED, That To-morrow the Lords will send to the Lower House, for Conference touching the Bill for restraining of Canons Ecclesiastical, not confirmed by Parliament. This Day, before Prayers, in Presence of divers of the Lords of the Council, and many others, the Lord Morley and the Lord Arundell, kneeling, did voluntarily take the Oath of Allegiance. Hodie 2a vice lecta est Billa, An Act against scandalous and unworthy Ministers. L. Bp. of Bath and Wells. L. Zouch. Appointed to meet on Tuesday, the 17th of July, at Two of the Clock in the Afternoon, in the Council Chamber at Whitehall. 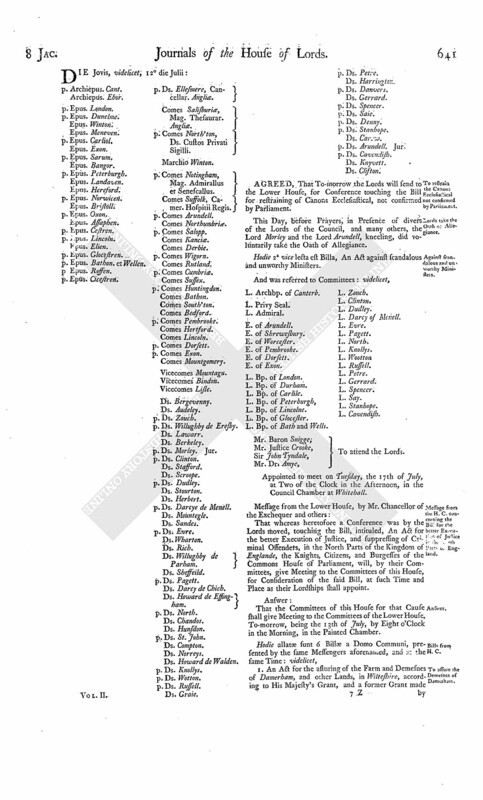 That whereas heretofore a Conference was by the Lords moved, touching the Bill, intituled, An Act for the better Execution of Justice, and suppressing of Criminal Offenders, in the North Parts of the Kingdom of Englande, the Knights, Citizens, and Burgesses of the Commons House of Parliament, will, by their Committees, give Meeting to the Committees of this House, for Consideration of the said Bill, at such Time and Place as their Lordships shall appoint. That the Committees of this House for that Cause shall give Meeting to the Committees of the Lower House, To-morrow, being the 13th of July, by Eight o'Clock in the Morning, in the Painted Chamber. I. An Act for the assuring of the Farm and Demesnes of Damerham, and other Lands, in Wilteshire, according to His Majesty's Grant, and a former Grant made by King Edward the Sixth, with certain Amendments added by the Commons, which were Twice read and appointed to be ingrossed in the Body of the Bill. 2. 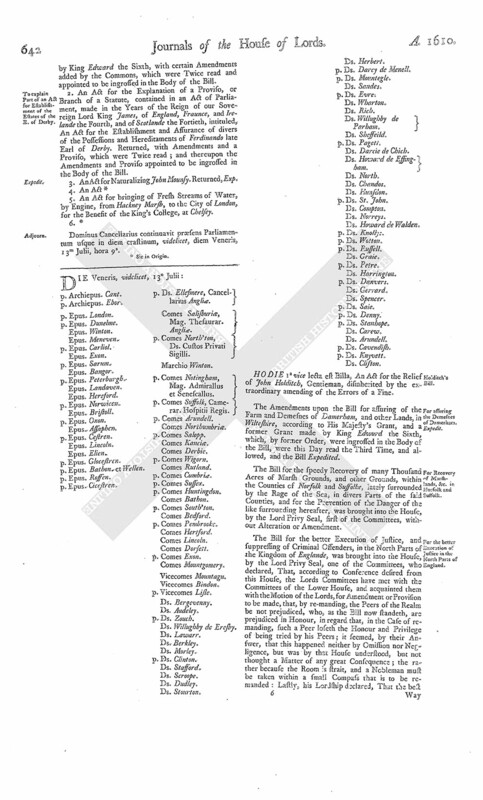 An Act for the Explanation of a Proviso, or Branch of a Statute, contained in an Act of Parliament, made in the Years of the Reign of our Sovereign Lord King James, of England, Fraunce, and Irelande the Fourth, and of Scotlande the Fortieth, intituled, An Act for the Establishment and Assurance of divers of the Possessions and Hereditaments of Ferdinando late Earl of Derby. Returned, with Amendments and a Proviso, which were Twice read; and thereupon the Amendments and Proviso appointed to be ingrossed in the Body of the Bill. 3. An Act for Naturalizing John Mounsy. Returned, Exp. 5. An Act for bringing of Fresh Streams of Water, by Engine, from Hackney Marsh, to the City of London, for the Benefit of the King's College, at Chelsey. Dominus Cancellarius continuavit præsens Parliamentum usque in diem crastinum, videlicet, diem Veneris, 13m Julii, hora 9a.